I’m Kelly Hobkirk, a writer, type designer, and identity designer who helps companies create, design, and market brands that matter. 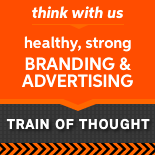 I am the co-founder, creative director, and senior copywriter at Train of Thought, a graphic design, branding, and advertising firm. I teach workshops on branding and marketing. Previously, I have held the positions of Marketing Director, Art Director, and Graphic Designer. My design work has been featured in books published by Rockport and Rotovision, and in Time Magazine, among others. I combine experience and talents in strategy, graphic design, copywriting, web design, type design, package design, advertising, and marketing to raise brand profiles, awareness, and ultimately sales, for my clients. I am also a book and publication designer. I teach people and companies about branding and marketing, and share unusual business insights on kellyhobkirk.com. I sleep, wake, cook gluten-free, and ride bicycles in Seattle, Washington.